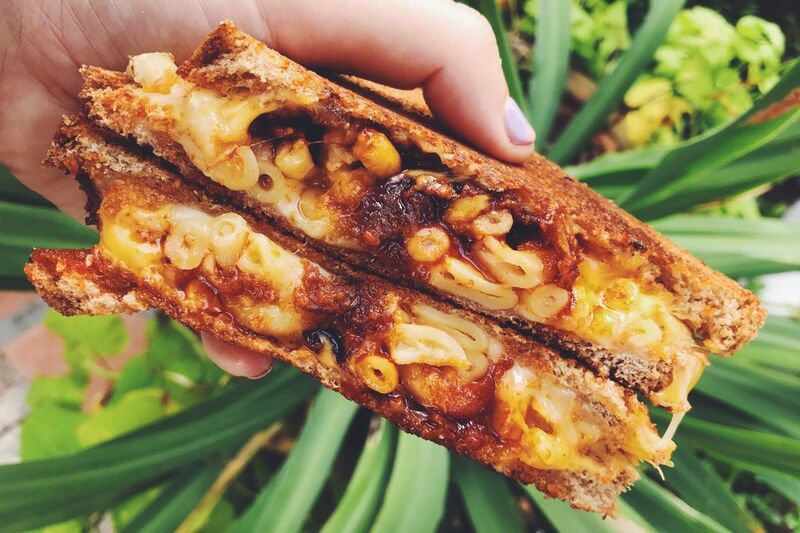 This grilled macaroni and bacon jam grilled cheese is literally the jam! You can either make the macaroni and cheese yourself or use what you've got on hand or as leftovers. The trick is to use cold (or room) macaroni and cheese so that it stays together better during the grilling process. And if you don't eat bacon, don't worry! Leave out the bacon and add double the amount of onions for a ridiculously yummy onion jam that goes perfectly with the gruyere mac n cheese recipe below! In a medium sized sautee pan, cook the bacon over medium heat until the fat has rendered out and the bacon is almost crisp. Remove cooked bacon whilst leaving bacon grease in pan. Add onions and sautee until caramelized and soft - about 15 minutes. Add chopped crispy bacon back to the onions and stir in brown sugar. Add vinegar, chili powder, cayenne pepper, coffee, curry powder, and salt and pepper and cook on low for at least an hour in a half or until a thick jam forms. Boil water and prepare macaroni noodles until al dente. Drain and set aside. Meanwhile, add butter to a sauce pan and turn the heat to medium. Add shallots, garlic, and sage leaves and cook until softened but not crispy. Add the flour and cook for a few minutes until a loose roux-like substance starts to form. Add in the heavy cream and let cook until bubbles form on the sides of the pan and the cream starts to reduce and thicken a little. Add in gruyere and stir in a figure 8 motion until the cheese melts and sauce starts to form. Stir in mustard powder, frank's hot sauce and add salt and pepper to taste. Remove from heat and let it cool so it coagulates and sticks together. Place two slices of cheddar onto one half of the bread and top with macaroni and cheese, the bacon jam, the other half of the cheese and the remaining slice of bread. Butter the exterior of the sandwich and place in a fry pan or panini press. Cook until both sides are golden brown and all the cheese has melted. Remove from heat, let sit for a minute, slice and serve.